How to conduct the required station evaluation. Amateur operators must estimate the RF power density in the main lobe of each transmitting antenna to determine the safe distance required to meet the Maximum Permissible Exposure (MPE). The MPE Calculator was developed to perform these calculations and prepare the complete station evaluation for the amateur radio operator. MPE calculations must consider frequency of operation, operating mode (SSB, CW, etc. ), RF power delivered to the antenna, antenna gain, and the presence or absence of ground reflection effects. Once the safe MPE distance is known for each antenna, power level, and amateur band in use, the operating site must be evaluated to determine if anyone can get close enough to the antennas to exceed the Maximum Permissible Exposure limits. If unsafe conditions exist, corrective steps must be taken to prevent excessive exposure. Such steps might include reducing transmitter power, posting of warning signs, changing operating mode, or time-averaging exposures. Using the MPE Calculator to evaluate your station. 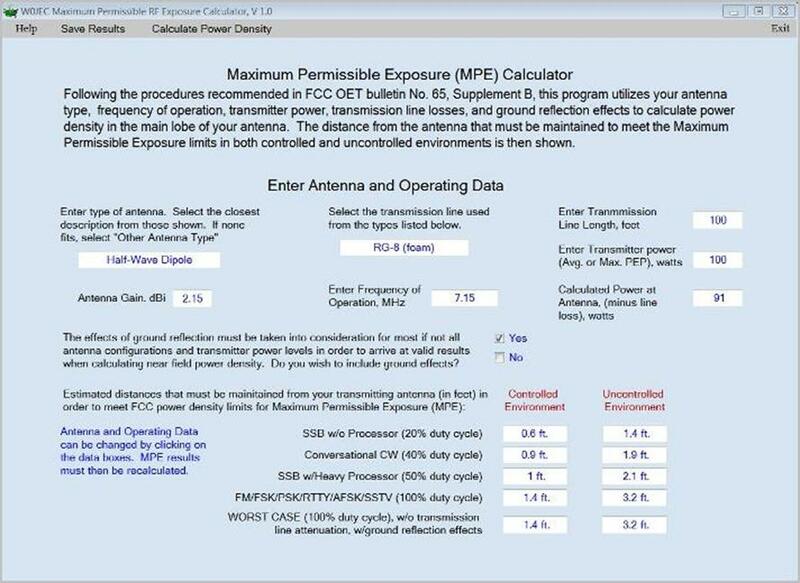 The MPE Calculator software performs a comprehensive station evaluation for each of your transmitters and antennas, producing evaluation results both on-screen and by printout. The software runs on all current Windows operating systems utilizing any of the standard printers. A comprehensive Help file is included to give detailed instructions for each step in the station evaluation. Data Entry: The amateur operator enters transmitter power (time averaged or maximum (PEP)), selects transmission line type from a list, enters transmitter line length, selects antenna type and gain from a list (or enters antenna description), enters frequency of operation, and chooses whether or not to consider ground reflection effects. Each antenna configuration is evaluated separately. Results: The MPE calculator software cannot generate results until ALL required information is entered. Once all data boxes are filled, the program will display the RF power delivered to the antenna (based on transmission line type and length) and a complete MPE results table (safe distances from the antenna in feet) according to operating mode for both controlled and uncontrolled environments. A printed report is available giving the complete station evaluation documentation in the suggested FCC format. This printed report should be filed for future reference. Multiple Transmitter Evaluation: For the evaluation of multiple transmitter sites, the MPE Calculator software includes a Power Density Calculator option which calculates the RF field contributed by each transmitter and antenna in simultaneous use. This feature is a must for evaluating repeater sites (including those having ham transmitters operating along with transmitters operating outside of the ham bands), multi-op contest sites and field day sites!